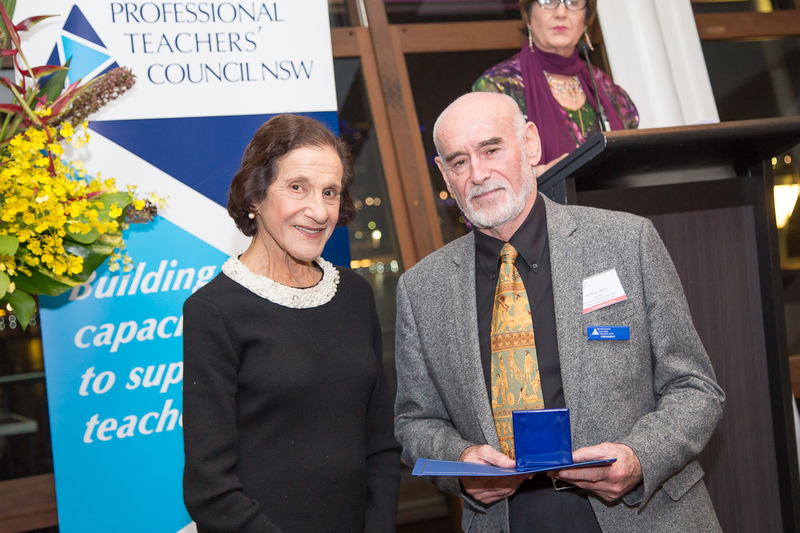 This prestigious award, in honour of the Professional Teachers’ Council NSW patron Professor The Honourable Dame Marie Bashir AD CVO, was presented for the first time in 2016. The medal is awarded to a member of the teaching profession who has shown outstanding leadership in the field of education. Denis has demonstrated outstanding leadership in the field of education. He is courageous, trustworthy and entrepreneurial and has led the Professional Teachers Council NSW (PTCNSW) with integrity. Denis focuses the PTCNSW on the big picture and encourages and enables PTCNSW committees, teaching associations to thrive and try new approaches. Denis has been a director of the Professional Teachers Council NSW from 1998-2002 and 2004 to the present. During this time, he has undertaken various roles including Vice-President and President. While a director of the Board, Denis has led and engaged in all levels of professional teaching association activities involving governance, advocacy, policy development, research, professional learning, events and communications. Denis commenced as President of PTCNSW in 2015 and continues in this role at present. He has influenced and contributed to the professional standing of teachers through his leadership of the development of partnerships with Dr Joan-Mary Hinds which led to the Teacher Motivation Survey used by schools to provide data for their annual school plan. Denis has worked tirelessly to develop strong governance and management processes for the PTCNSW under the requirements of the Corporations Act. He has developed a collaborative decision-making structure based on standing committees for all major areas of PTCNSW’s operation. In doing this, he always acknowledges the support of all PTCNSW Directors and teaching association representatives. Denis has developed strong strategic relationships with a range of agencies and organisations such as NESA, the NSW Department of Education, Catholic Schools NSW, the Association of Independent Schools, Macquarie University, the Australian Catholic University, the Independent Education Union and the NSW Teachers Federation. He has developed a number of partnerships that have led to research projects, professional learning and infrastructure support for associations and teachers. Through these partnerships he has led the development of PTCplus, a whole-school non-curriculum based professional learning initiative. With the co-operation of the PTCNSW’s member teaching associations, faculty or curriculum based high quality professional learning can also be delivered. He has also led the development of PTConnect, PTCNSW’s bespoke phone .app used for major conferences and numerous professional learning events. In addition to his relationship with PTCNSW, Denis has also been a highly active supporter of the History Teachers Association of Australia since 1998 as a Director, Vice President and Secretary. Denis has provided insight to many curriculum committees including the HSC Exam Committees, as member and Chair. Denis has further applied his passion for History by becoming the History Channel’s Education Consultant from 1998 to 2016. Denis’ contribution to the teaching profession makes him a worthy recipient of the Professor Dame Marie Bashir Medal for Outstanding Leadership in Education. 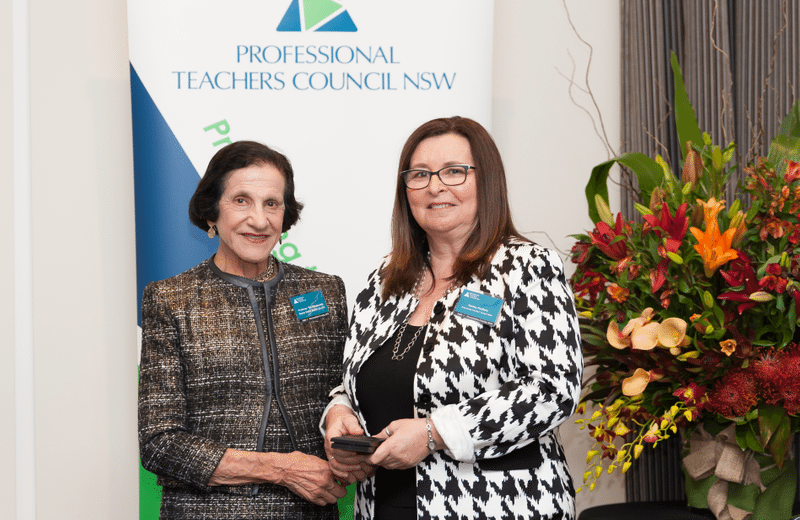 Nerina Pretlove has demonstrated a substantial commitment to PTC NSW. She has been a Director of PTC NSW since its early inception as the Joint Council of Professional Teaching Associations (JCPTA) NSW. During this time, she has had various roles including Vice-President and President. While a director of the Board, Nerina has led and engaged in all levels of professional teaching association activities involving governance, advocacy, policy development, research, professional learning, publications and communications. She has also represented PTC NSW for a number of years at the national level as a member of the board of APTA, the Australian Professional Teachers’ Association where she has represented the interests of Australian teachers and Teacher Associations at overseas meetings relating to teaching associations and professional learning. Nerina has represented NSW teachers in numerous forums and committees and is also a Ministerial appointment to the Professional Learning Evaluation and Assessment Committee, PLEAC, and the Quality Teaching Council. Nerina has contributed to the professional standing of teachers through her development of new associations when she believed there was a need. Most recently she has had a hand in developing the Professional Casual Teachers’ Association in NSW, an association created to support casual relief teachers in their professional learning so that they can draw on a body of knowledge when responding to the learning needs of students within varying classroom contexts. Nerina has acted as a mentor for many new directors who promote and lead professional teaching associations. She initiated development of the Professional Teachers’ Council NSW Director’s Induction Booklet and program. This work could be used as a best practice model by other professional teaching associations. PTC NSW is not losing Nerina’s corporate knowledge as she will be the first member called to our 2017 Presidents’ Advisory Committee. Nerina has been a vocal and tireless advocate for the students and teachers of NSW and her passion, dedication and enormous contribution to the teaching profession makes her a worthy recipient of the inaugural Professor Dame Marie Bashir Medal for Outstanding Leadership in Education.